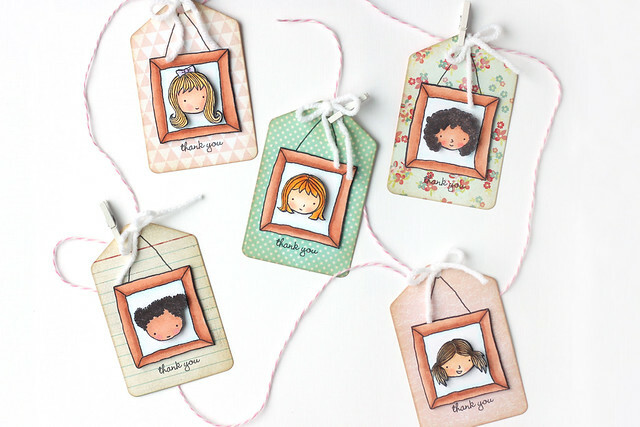 Do you know how I got started stamping? 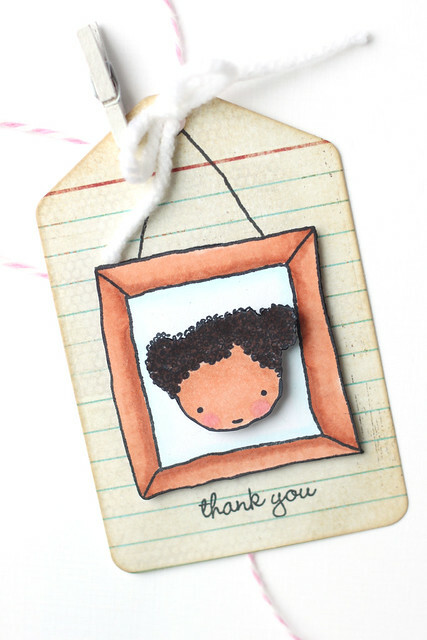 I saw a tiny ad on the side of my facebook page - it featured a stamped card with the title "stampin' up!" at the top. I saw it a few separate times before I clicked the link. I never click links. But it led me to the SU! main page, and I loved everything I saw. I found a local demo, who came to my house and showed me a few techniques and stamps for over an hour without pressuring me to buy anything. The stamps sold themselves. 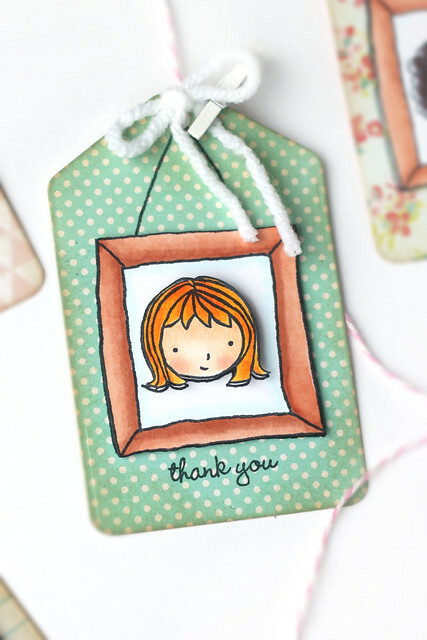 I've since branched away from Stampin' Up, but I will always love it for introducing me to this amazing hobby. Recently, I spied clear stamps in their store that I had to own. These sweetie pies and their frames are too cute for words. 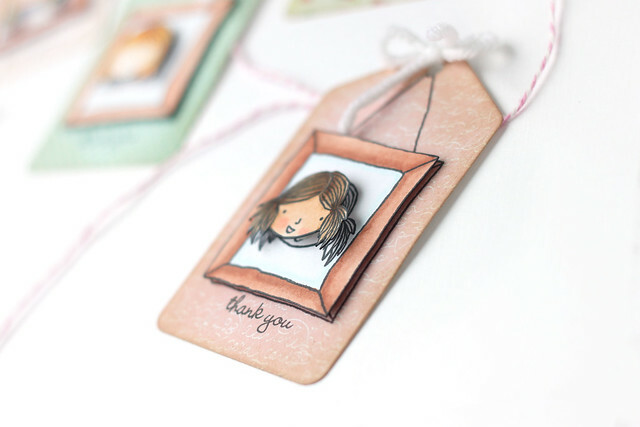 I couldn't help but whip up a set of thank you tags with them. I popped up the frame using SU! dimensionals. I love them - they are the thinnest pop-up dots I could find, and give a very subtle raise to the frame. For the girls' faces I used thicker foam squares. I was really happy with the quality of the clear stamps! I wasn't sure how well they would work, as SU is more known for their rubber stamps, but I was pleasantly surprised. If they keep making whimsical designs like these 2 stamps sets, I'll be buying. All of the links will lead you to my friend Veronica's SU! page. If you live in the US and would like to order SU! goodies, she'll be more than happy to help you out. Tomorrow is Thomas' BBQ party! If you'd like to see a few behind the scenes shots, find me on instagram (mom2sofia.) I'll share the invites and the entire party next week. Happy weekend! 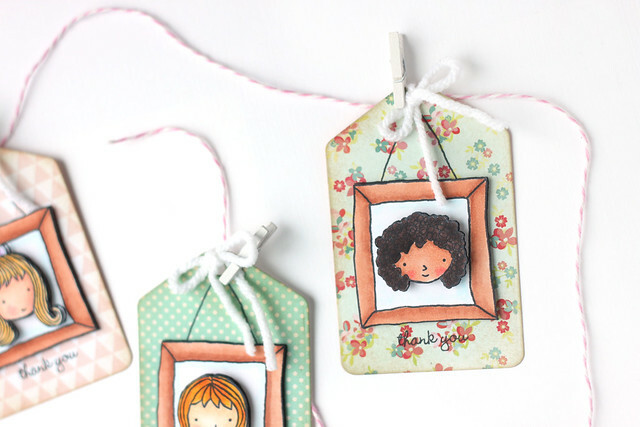 These tags are just darling! Love the coloring and paper choices, they will be a hit! These are so, so sweet! I also love SU! dimensional adhesive -- they're my favourite pop-up adhesive!